PLUS hundreds of digital data decoder screenshots! Broadcast database: 4,619 entries with the latest schedules of all clandestine, domestic and international broadcasting services on shortwave, compiled by top experts in this field. A powerful concurrent full text word search is included as well. Runs under Windows .../XP/VISTA/7/8/10/... Whether you are an international radio listener, a businessman or a tourist travelling worldwide, a professional monitoring service, or a circumnavigator sailing around the globe: This is the way - just a few keystrokes and you have it all! Apart from the usual incremental search features, the most powerful tool is the concurrent full text search facility (function key F9). Examples: in the broadcast database BC2019, entering the words ind en takes you, within less than a second, to 87 entries with all All India Radio frequencies worldwide broadcasting in English. The search word sequence is free: if you enter sp 22:23 la this gives you 22 entries with all broadcasts in Spanish to Latin America at 22:23 UTC. If you enter drm this gives you 45 transmissions with the interesting new Digital Radio Mondiale technique. If you like exotic languages, tb gives you 119 entries with all programmes worldwide in Tibetan. !670! fascinating new screenshots from stations all over the world - continuously updated here! Utility database: 8,467 special frequencies from our international bestseller 2019/2020 Guide to Utility Radio Stations. Plus 930 abbreviations and 23,813 formerly active frequencies - all on one compact disk for PCs with Windows. Not only can you browse through all that data in milliseconds, but you can search in next to no time - even combined! - for specific frequencies, countries, stations, languages, call signs, and times as well. It can't get faster than this! In the utility database UT2019, entering the word air gives you more than 2'000 (precisely: 2'139) entries with all data and voice frequencies of the Aeronautical Mobile Service worldwide. Entering the words aus ssb gives you 357 entries with all SSB frequencies of stations in Australia. sailmail gets you 142 entries with all frequencies of the Sailmail association worldwide. If you enter dig r you get 295 entries with all digital data transmission and teleprinter frequencies of coastal radio stations. If you enter ale usaf you get 182 entries with all United States Air Force stations using the Automatic Link Establishment digital data system. rus finds you all entries (488) of stations in the Russian Federation. If you enter pactor you get 105 frequencies of stations worldwide using the PACTOR digital data transmission system. In the former utility transmissions database OldFreq, entering the words c and w gives you a list of 98 entries with all former Cable & Wireless frequencies from Banjul, Belize, Bridgetown, Cockburn Harbour / Grand Turk Island, Georgetown / Grand Cayman, Gibraltar, Jamestown, Manama, Port Louis, Port Mathurin, Port Stanley, San'a, Victoria, and Victoria Harbour. usr finds you all entries (1111) of stations from the former Union of Socialist Soviet Republics. By means of the mouse cursor in the headline of a table you can rearrange the order of the columns according to your needs, and you can modify the widths of the individual columns as well. There are many more fascinating features of our new software. Enjoy it. This unequalled product is based on 50 years of experience in the radio monitoring and publishing field! 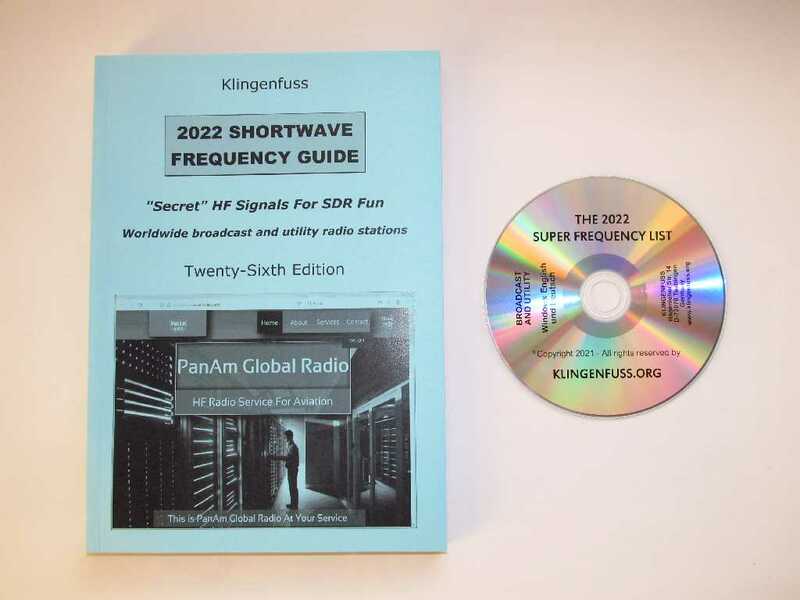 Due to popular request, we offer you a special package price of only 60 EUR for both this CD and the 2019 Shortwave Frequency Guide ordered together. Click here for more package deals! 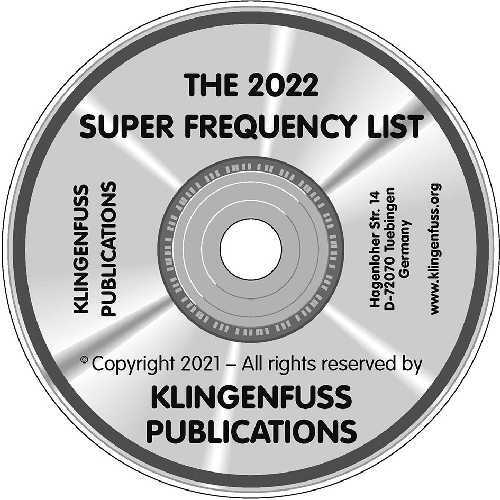 25 years after the spreading of PC technology all over the world, the publication of frequency lists by the medium of CD is considered to be a standard procedure among state-of-the-art companies in this field, and it is a must for leading publishers such as Klingenfuss Publications. We have been around for 50 years already. For decades, we have been the world leader in publications on digital data signals decoding on HF. The unique Radio Data Code Manual - used by radio monitoring services around the world for training and operation - currently runs its 18th edition. The famous Guide to Utility Radio Stations is in its brandnew 30th edition. We now offer more than 17,000 (seventeen thousand!) digital data decoder screenshots on USB stick. Just for the record, other publishers have absolutely nothing to offer in this field, let alone something on USB stick.